Turn pretty embroidery, simple patchwork, and sweet appliqué details into extraordinary gifts that will inspire smiles! Sew your love into the gifts you give—you’ll find ten ways to do just that in Stitched from the Heart. From throws and wall quilts to a pincushion and mug rug, these ready-to-personalize projects are sure to create long-lasting memories. Patterns for a hand-lettered alphabet in two sizes make it easy to embroider the heartfelt phrases provided or to customize projects with names, dates, sayings, and more. Whether you want to celebrate, inspire, empower, or comfort, these charming gifts all come from the heart. 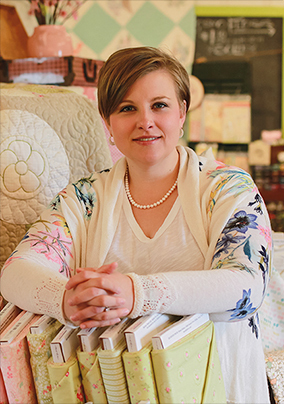 We’re happy to have author and quilt-shop owner Kori Turner-Goodhart of Olive Grace Studios as a guest writer to tell you more about her beautiful new book. I am still in pinch-myself mode that this small-town girl got to write a book and that I get to share with you these sweet projects that I have held close to me! Following my heart has guided me through my life. When I proposed the idea for Stitched from the Heart, I wanted to make sure that makers could see my heart in each project. One of my biggest joys in life is giving gifts, and what better way is there than to stitch those gifts with love? Each stitch you take, no matter if it’s by hand or machine, means something. 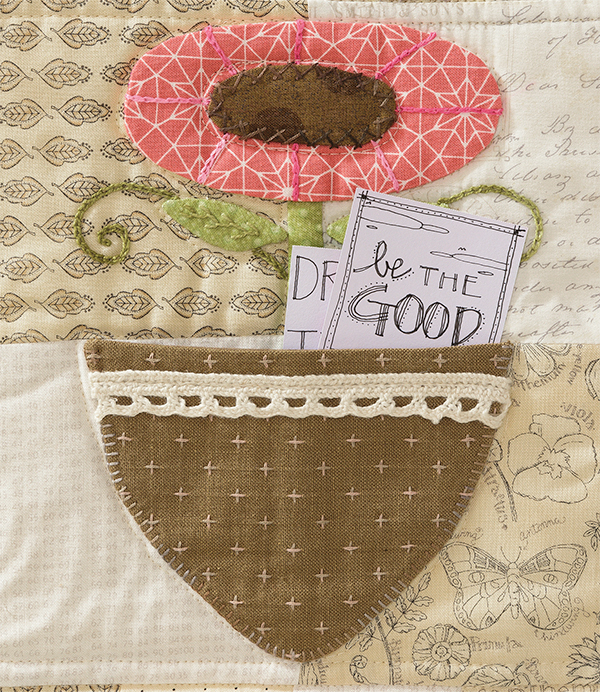 Pocket for Your Thoughts close up—look at all the lovely embroidery details! In each of the projects there’s a sentimental way to celebrate your project’s recipient. You can use my customizable hand lettering for monograms or to add words and phrases that are important to you and your loved ones. 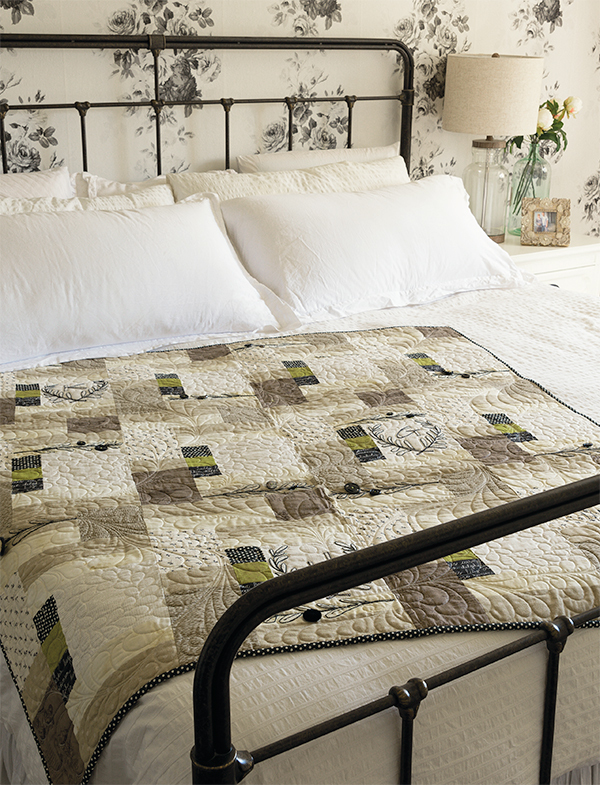 The quilt is a modern take on a signature quilt, meant for a new couple or a couple who has many years of love under their belt. Imagine making this for a niece or nephew who’s getting married and presenting it at the bridal shower. Then, guests at their wedding can sign their names in the light rectangles. I encourage you to use grandma’s old button box for this quilt. Pull out pretty black buttons for the olive branches. You could even add old lace to some of the blocks from a loved one’s wedding dress. The possibilities are endless for making the quilt original to you and your recipient. And always make sure you add your own handwriting somewhere, even if it’s just on the quilt label. I’m so honored for this opportunity to share my designs with you. From the bottom of my heart, I hope you enjoy each project as much as I have. They say it’s better to give than to receive, but I hope that you make one of these special projects for yourself! Thanks for sharing your new book with us, Kori! Who’s the lucky person who’ll receive a handmade gift from you next: a family member, a friend, a sewing buddy . . . yourself? We’ll choose a winner one week from today and let you know by email if you win. Good luck! And if you’re ready to start winning at gifting all year long, pick up Stitched by the Heart at our website and you can instantly download the eBook for free. We’ll email you about your prize, Terri—congratulations! I would love to make something for my sister, who inspired me to stitch! Next person, will be my friend is treatment for a third cancer. Love the ideas, shown in the here. "You are brave" wall hanging for a friend who is in her second battle with cancer which is unrelated to her first round. She has faced the treatments leading up to surgery with grace, dignity and unfailing faith winning her great admiration. Next big project goes to son and brand new daughter-in-law! My dear, dear friend is facing breast cancer surgery. I would live to make her a special gift from your book. Every Monday morning a dear friend opens her home so a group of Quilters can come in and make quilts and teddy bears for the local children’s hospital. She is very heartwarming and dedicated to this mission. She is always doing for others and I would love to make something for her. My next project are some cushion covers for my home. This book has some lovely ideas and projects. Inspiration! My dear friend and neighbor will receive the next hand-made gift I make. We even share next-door birthdays and we are 10 years apart in age minus 1 day. (I am the old one.) I am excited about this book. Thank you. I will definitely make something for someone in the family. Beautiful samples in this book! What a treasure to have. Probably my Aunt as she has been helping me with a difficult time I have been going through and I would like to make her something to show how thankful I am! A friend will receive a homemade gift from me next. This book is great!! I’m just putting the finishing stitches into a retirement quilt for a former supervisor – he finishes up the end of this month, so unless I get ambitious and make a few gifties for Easter, his quilt will be the next gift I give. It would be my Aunt Donna as she has helped me get through a difficult time and I would like to make her something nice to show my appreciation! The next person to received a handmade gift from me is my friend who is a huge Dr Who fan and I am making a quilt for her with Dr. Who Fabric. I am working on placemats that will be donated to our local Meals on Wheels. They will be given as a gift to a Meals on Wheels recipient along with their meal. What a fresh and beautiful group of projects! I have been working on a lap quilt for a friend of mine. This book is really cute! Pocket for Your Thoughts. I would make this for my son and his wife and six kids. The 8 pockets would be perfect. I’m making a baby quilt for my nephew and his wife. The next person who is to receive something handmade from me will be my sweet baby granddaughter who just turned 1. So she is getting a lap blanket, that will be nice and big for her. I would win twice if I won! WOW! You have inspired me to want to hand stitch again! They are all charming… which one to start FIRST? Probably ‘Pocket for your thoughts’ for my teenage Granddaughter … love notes from Grandma! My granddaughter’s 4th birthday is next month…she is first on the list! Those are really sweet projects. I wasn’t aware of the book – thanks for sharing! This book will be perfect to get a head start on ideas for holiday gifts for family. These quilts are lovely and very inspiring! I usually make gifts for friends and family. When I was scrolling through these, I immediately thought of my middle grandson. He’s in an abusive situation and it’s breaking his mother’s heart and mine. But, we can’t do much about it unless the courts intervene. When I saw the "you are brave" project, I knew I had to make it for him. Oh my gosh, these patterns are all so yummy – but the one that struck my heart was ‘A Pocket for Your Thoughts’. Our granddaughter just entered middle school this past fall – all new kids, few familiar faces – and we all know what a tough age group that can be. This quilt would be perfect for her because she would be able to read messages from those that love her, so she could realize that things will be better. I’m currently stitching a crossstich panel of three geishas onto a tote bag to give a friend. My daughter will receive a gift from the book. Greetings from Northern Saskatchewan Canada! What a great book!! Projects are beautiful! The Pocket for Your Thoughts project recipient would be my daughter who is working on her elementary education degree. It would make a creative way to share positive thoughts in the classroom. I think my secret sister at our quilting guild is next up for something lovely! Looks like a lovely book with very nice projects. Saw several that I would like to make. My daughter, always my daughter and grand daughters!! Finally found something that inspires me! Something that is "dainty"! I have 3 wonderful daughters and 2 daughters-in-law — I am hoping to make something very special for them for Christmas; I just might find the perfect thing in this book! I’ll be mailing a friend a handmade gift for her birthday. Possibly a friend, a family member or myself. My daughter-in-law will be receiving the next gift! Thanks for the wonderful giveaway! Love these ideas and especially the bed runner with the birds! Such a great group of projects! I have a good friend that has a quilt shop and she is turning 90 this weekend. I am going to make her a hand stitched birthday card. I will be making a very special quilt for my granddaughter. She is already such a sweet little lady who loves to snuggle in her "quilts". Thank you so much for this opportunity! I love to mix up piecing, applique & a bit of embroidery. And I love words on my quilts. This book looks so sweet. Perfect for me. Thanks again. Definitely my daughter, she gets a lot of my homemade stuff, good or not so good! What a wonderfully pretty projects book! My dear friend who has been dealing with cancer. I love Kori’s designs in her new book, each one is so fun! This would be new learning hand embroidery, I’ve been doing embroidery so far on my machine. This will be my new challenge for this year! Thank you! My daughter who I am going to visit in June in Texas. Such sweet patterns, love them! Since I love making things for my granddaughter I would probably make something for her. I’d sew something for my niece. These projects are so sweet!! What a lovely book! Perfect for making gifts. I will be making a gift for a family member and friend. My see granddaughter ❤️ Making a quilt for her room in a new house !! My sister would be first on the list. I love the new book! Hope I am a lucky winner! My next quilt is red,white and blue. It is going to a veteran. My sister-in-law, Meg. My brother posed away a year ago. I’ve made a quilt for her using his old shirts. I just need to quilt it. A sewing buddy is next on my list but family usually receive most of my handmade gifts. I have a great friend who deserves a hand-made gift from me! She’s been there for me every time I’ve needed her, so this book is filled with inspiration to get that gift completed! I would make something for my grand daughters should I win. I love these projects. I think I would make one for my friend, Flo. She is a special person in my life. I would love to own this delightful book. I would make a gift for a dear friend who recently lost her husband and lives very far from me. I would make one for my mom and then one for my friend, Shannon. I recently finished a needle book for a dear friend who turned 90. My next project is to finish a quilted wall hanging for our daughter. Just finished a pillow meant for a BD gift for a friend. The projects in this book are beautiful. I have three granddaughters who are young adults and would love to make each one of them something from this book. I love the work you do, everything is so pretty and beautifully done, I am so new to quilting and sewing, I hope I can do some of it in time. I would love to win a copy of Stitched from the Heart. Hope I am the lucky one. I love to make and gives gifts to my friends and family, it’s like giving a little piece of yourself to them. I love simplicity unyet detailed features of the projects that express the feelings of my heart. Lovely! I think a couple for me and a couple for friends! My next gift will be to a friend that donates her time for special causes. My lovely niece would really appreciate a quilt with embroidery from this book! Truth be told…I might just have to make it for myself first and then give to my granddaughter!! I love your book! I would to make the "You are Brave" for both my daughters – what a wonderful gift idea. Also, my mom would love any of these ideas for Mother’s Day. My great nephew is receiving a baby quilt! I have made baby quilts for all of our new great nieces and nephews with their names and birthday dates embroidered on the label. Thanks for the chance to win this great book!! I would happily give it to my daughter. I will be making something from a friend who lost her significant other right after Valentines Day. She posted something on FB recently that let me know she was going through a rough patch so I’d like to send her something to cheer her up. That YOU ARE BRAVE wallhanging would actually be perfect. My daughter in law is a wonderful woman and wife to my son. She has tried for years to get pregnant and in spite of her heartache she has been gracious and excited for the other family members when they did have babies. But she has double good news. We are so excited that she is expecting now – and after 6 well loved grandsons we are finally getting a girl baby. So excited to make pretty things for her! I can see the perfect gift for a dear friend’s birthday! Fingers crossed!!!!! I have three nieces all graduating high school in June. I am making each girl a quilt to take off to college with them. My next quilt project will go to a family member. Easter/Spring themed wall hanging. I have just finished a quilt for a 2 year old family member. It will be his first quilt. My husband’s wife was placed in a nursing home yesterday. I have a special quilt I made for her. My daughter-in-law’s birthday is coming up and she loves my handmade gifts. A sewing buddy will be the next recipient of a handcrafted gift, followed closely by items for grandchildren. This book is delightful! For starters these will be for myself. They are great reminders to start each day. After that I would make a few gifts for family members. My soon to be born great nephew will get my next hand stitched gift. He’s due in 2 weeks. My dear friend, Susan would get a gift from the book. She has recently become a widow. I’d love to have this book to make something special for my dearest friend Teresa! Beautiful book. Would love to make something from it. This book is full of good ideas. I would make several projects for friends and family (and for me). What a sweet book!! 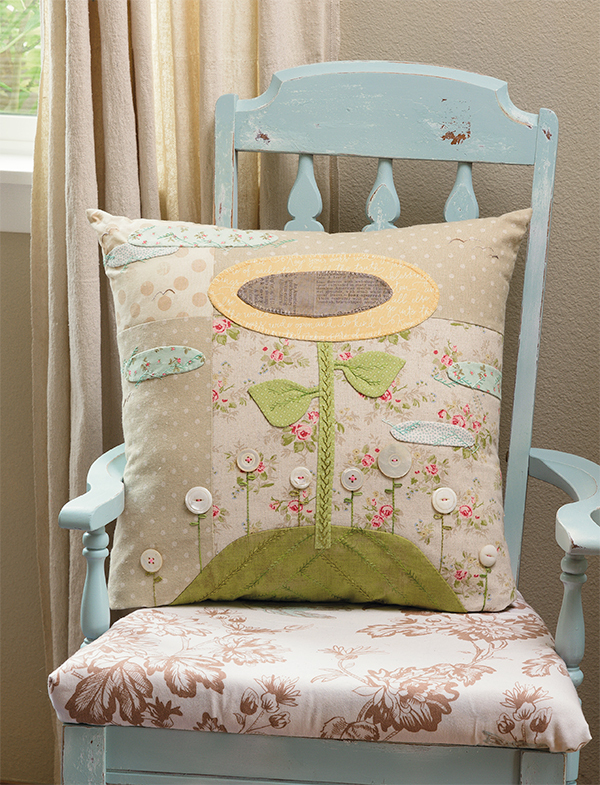 I would love to make the flower pillow for my sister who has struggled for years with arthritis. She and I enjoy being together, laughing and sharing what’s on our hearts. I’m working on a colorful school of fish quilt for our friends in Great Britain first grandchild. Adding a few words of celebration would be a great idea! Love the fonts! Most likely my daughter or granddaughter. I’m just finishing up a rather large king size quilt for my bed … so it will be for me! Yay! It’s so pretty, I love ❤️ it. What s lovely book. Wonderful ideas. I’m making reading pillows (a pillow with a pocket for a book and a stuffed animal) for the kids at my local homeless shelter. My daughter-in-law will be getting a small quilt from me on her birthday. I am planning on making 2 Easter table runners, one for my parents, and one for my sister. They live far away so hopefully this will make them seem closer. I would gift my daughter who is in need of lots of encouragement right now. My mother is getting anything I make right now. She likes having "me" (my handwork) surrounding her in her room. I love Stitched from the Heart! Just my style! I would make the YOU ARE BRAVE wall hanging for my friend who just under went 6 weeks of radiation therapy for breast cancer. 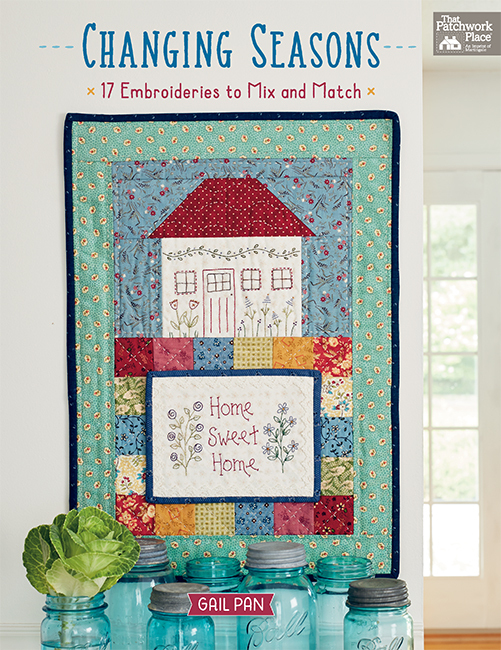 A family member – one of my grand daughters – would get one of these darling quilt projects. I just love giving and making gifts for my family. Daughters, granddaughters, nieces and of course my only sister. I make small things for their homes such as table runners, pillows and pillowcases. I incorporate applique,stitching and embroidery in all that I give. I would love to add this book to my collection of inspirations. This looks like a fun book. Love the flowers.Thanks for a chance to win. My next handmade gift is going to a niece who is going thru her second round of breast cancer which has spread. In fact I am finishing up the binding but now I want to add some words. Great book. I would make something for a friend that needs some encouragement. A family member is likely to get a handmade gift from me next. This book has great projects! Thanks for the giveaway. My sister, Beth. I’m making Kori’s Effie quilt pattern for her! I have all the birds embroidered and am starting on the buttons! I would like to make adapt the "Brave Little Love" quilt to make a lap size version to donate to one of the women graduating from a local rehab program. Love the look of this book. Wonderful ideas and projects. I would be gifting something to my first grandchild, which happens to be a little girl. So excited for her arrival!! My youngest sister will be receiving a handmade gift next. I always try to give something handmade/heartmade as gifts and her birthday is next up! This is one of the prettiest collection of gifts to make that I’ve seen in quite a while and I genuinely mean it – not a comment just to win a giveaway. I love the positive message of being brave and the wall hanging to put love notes and words of encouragement in the pockets for family and friends. My sweet sister will get those adorable birds for a runner on her bed. She loves birds but can no longer fill a feeder so she misses seeing them. We are now living on opposite coasts, so I think some birds in her mailbox would brighten her day! My sweet sister will get those adorable birds for a runner on her bed. She loves birds but can no longer fill a feeder so she misses seeing them. We are now living on opposite coasts, so I think some birds in her mailbox would brighten her day! Pick me Pick me!! I so want this book. My next handmade gift will go to a secret pal in an online swap! So happy for Kor, she deserves this success! I love to give gifts that I’ve made to people I think would enjoy them, but I would like to make something extra-special for my mom! These projects are so sweet! I would love to win this book. My niece/godchild will be getting a quilt from me as a wedding gift. Thanks for the opportunity to win! I will be making something for my granddaughter who will be celebrating her second birthday in July. I try to give her something special every year and decided that this year I want to give me something special stitched with love. I would be stitching one of these treasures for one of my four sisters who doesn’t have a quilt yet. My fifth sister already has her quilt! Just beautiful. Would love to have. All the projects are wonderful. Both my granddaughter and a close friend would receive a handmade gift from me if I won this book. I’d love to have it, but both will receive a gift whether I win or not. I’d like to try some new designs though. Just beautiful. Would love to have. All the projects are wonderful. Best friends and family members would be the lucky recipients. A family member gets the next handmade gift. Love embroidery and piecing. This looks like the perfect book. 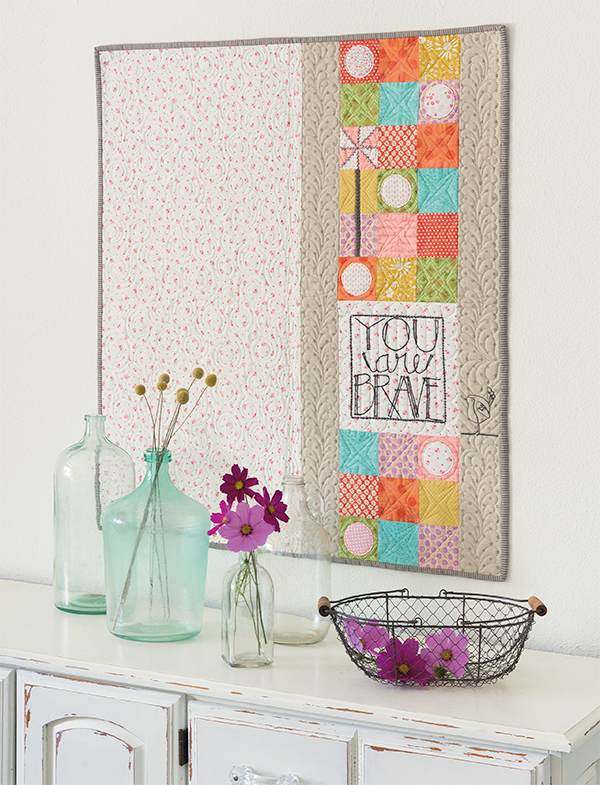 I love the quilt with "You Are Brave" and would definitely make this for me to remind me each and every day! My family members and coworkers will be on my list for something handmade this year. Next up is for one of my stitching companions, who is dear to my heart. One of those "for no reason" gifts we all cherish. Just gave a bereavement quilt. Ready to give a happier one. Love her sweet birds, perfect for a spring birthday. My sister who turns 50 the end of this month. I need to make the “You are brave” wall hanging for all of my nieces, but especially for my middle niece, who is in the process of becoming a single mom to two beautiful, but willful, babies (ages 3 and 1). It’s such a rough time for her right now, but she’s doing her very best to take care of her kids and help them understand the changes as best as they can at their ages. She is my hero! My mom will get the next love gift made with my hands. I love the embroidery and quilting mixed together……great idea! I have an old fashioned rag quilt I’m working on for my husband. My oldest friend and my sister! My SIL’s cousin is graduating from high school…basting is happening now! A family member will get you next handmade gift. I work in pathology and often make small quilts for Patients. The you are Brave nede me cry as many of the people i see are very brave indeed. Would be a perfect quilt to make. I would make the one family, one heart for my son and daughter-in-law and their six kids. My Step mom has a birthday coming up. I love to make her gifts! I love the style of these patterns! My next stitched gifts are for family. My twin grandkids turn 18 and this is their birthday quilt. A family member gets the next one, then me, then a friend, then me. Just like with cookies! 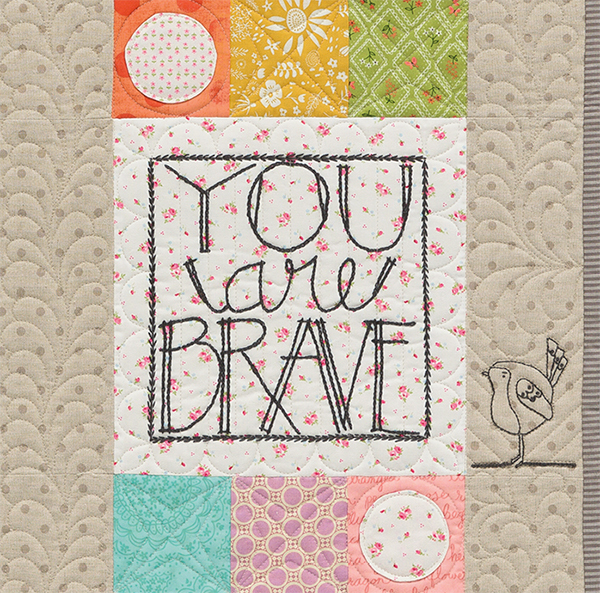 Some special friends are expecting their first child later this year and I have my eye on the "you are brave" quilt! Of course, I may just have to make one for each of my four granddaughters, too! My mum and aunties will receive my next handmade gifts. I live in a different country from my family so, that will be a reminder of how much I love and remember them. My niece, I’m finishing a quilt for her now and love the idea of adding words as she is undergoing her second bout of breast cancer which has spread. Great book. Pick me. Pick me please. I love love the had embroidery on these projects. I have a good friend that I would enjoy giving one of these hand stitched gifts — she would love to receive it and would appreciate (and understand) the time and labor that went into it. My family members, especially my grown up children…and some friends! My sister will receive the next project I am making which is a table runner. She buys me fabrics and patterns and I make them up for her. A friend will be the next one to receive a handmade gift. The next person I am going to make a quilt for his my mom. She has been waiting a long time for me to make her a quilt to fit her bed. Finally, I have the perfect pattern!!! Here it comes. mom! I’m making a baby quilt for a dear friends granddaughter who just had a baby boy. I’ll be making my daughter an apron. It will be reversible, as she fell in love with two totally different fabrics and couldn’t decide which. I would make one of these for my daughters & daughter-in-laws! They’re all really nice & I love making gifts this size! Oh what a delight, so many warm and touching projects. It would be a joy to use and make some special gifts with the wonderful home- made touch with class! Thanks for giving us a chance at this delight! I would make if I had thebook’You are Brave’ wall hanging or quilt for my daughter who had cancer which led to her heart, lungs, and vocal chords being damaged due to treatment and now has Cardio Myopathy. She is very brave, and is the mother of 3 children whom we love dearly. She very easily gets fatigued but tries her best to keep up with the demands of life and family. Three babies top the current list but it is always growing so we will see who else gets added!!! Two of the babies are girls I see some ideas in that preview. In the past I’ve usually stitched just for myself, but now that I have a granddaughter, I enjoy making little things for her as well. I have a lovely niece who would be delighted to receive any of the gorgeous items in this book. I would love to stitch a gift from my heart to one of my sewing friends. My next project will be for me!!! That doesn’t happen very often. This book is so inspiring- I will make something for my daughter. I will be the lucky person to receive something that I have made! I make so many things for everyone else, I decided to Kory’s Carmen quilt for myself! I dont know, I think my girls. My lovely daughter , mother of 3 young children will get a message to encourage her. I would love to use one of these patterns to make a gift for someone special. Eight cousins are coming to meet at the beach next weekend! I made each a fabric basket from fat quarters as a surprise! If I am the lucky winner I would make one of the special items for my daughter. She loves everything I stitch or quilt. Then of course I will have to make the same thing for myself. A grabddaughter gets my next handmade project for her birthday! For a dear friend whose cancer has returned. She is indeed brave! My sister for sure, and maybe a little something for myself😊 Beautiful book. I think I would give a gift to ME. Oh, how I love this new book, such lovely designs and art work. I would love for this book to be in my library. Thank you for the lovely book. My niece and nephew-graduation quilts! Stitching from the Heart is a very sweet book. I would make something for a friend! I would probably give one to a family member… but looking at the designs, I might keep it myself! I have a pillow in progress for my daughter. Probably myself! I can’t bear to part with such cute things! What a lovely bunch of projects! My mother’s birthday is coming up, and I know she would love that pillow! The new baby of a young man I used to care for in my home daycare. Love all those "kids". A friend is getting a pillow cover / wall hanging with a house block. 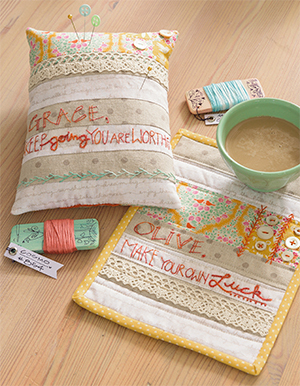 Just adore the sweet scenes, sayings, as well as the fabric and the sampler design. Thanks for sharing. I need a gift for a friend. The book Stitched from the Heart is adorable, I have been wanted to do more hand embroidery lately. I’m working on a counted cross stitch design for a friend. I hope to use it in making a tote bag. Thanks for the chance to win. 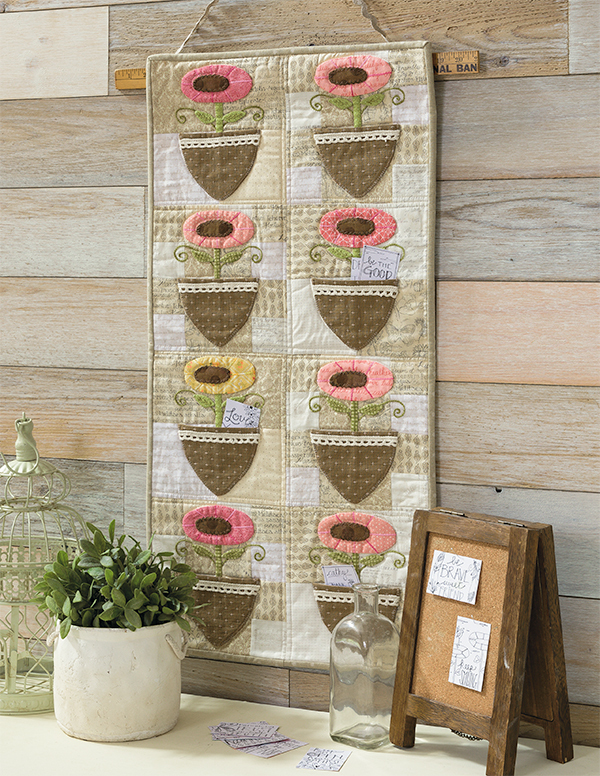 Stitched From the Heart has lovely designs. My grandkids are my priority for making keepsakes for them. Something they can proudly say was made by their grandmother just for them. This book would give me a lots of ideas. My next handmade project will go to a sewing buddy. I am making a wall hanging for my Sister for her birthday later this month , I have already started something but love the Idea of inserting a message and will try to make part of it a pocket. This book looks great! The next person to received a handmade gifts from me will be a family member. What a wonderful book and the colors are all lovely. i would make it for a very special friend for her birthday. I’m working on a table runner for my daughter. It’ll probably be for ME!!! 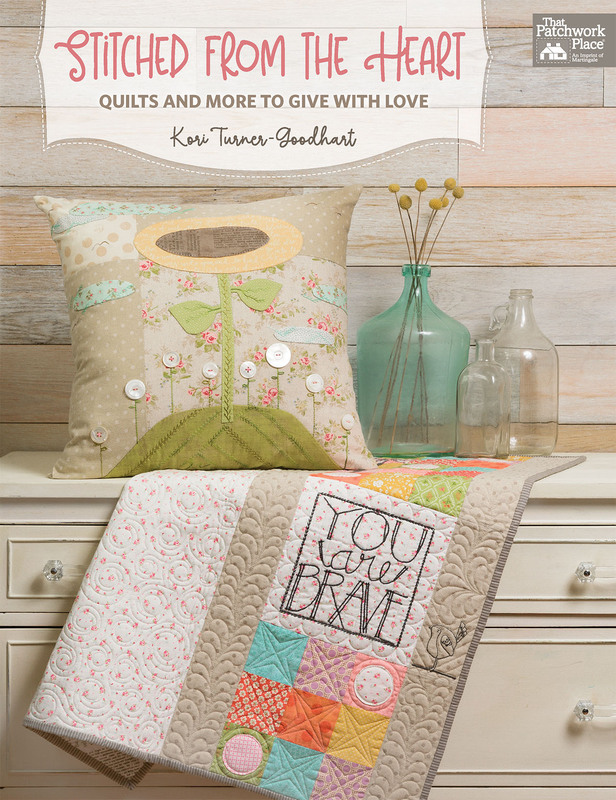 I love the “You are Brave!” Quilt. Would love to make it for one of the patients in the pediatric intensive care unit where I used to work! A family member will get the next handmade gift from me. The book looks great. Thank you for the giveaway opportunity. My son and daughter in-law will be receiving the next quilt I make. I have a new Great grandson. I’ll be stitching for him!! the book looks great. My stitched from the heart project would go to a special sewing buddy. I love the projects in this book! I have been wanting to make something for my friend Susan as she is the most giving and thoughtful person I know. The projects in this book look perfect for gifting. I am so excited for Kori, she is amazing in all ways, and I cannot wait to get her book Stitched From the Heart! Hi! Thanks for the giveaway. I would love to make the you are brave quilt for my mother. She is recovering from a fall in which she broke her ankle in two places and had to be non weight bearing for 8 weeks. She is learning to walk again!! My grandson would receive a stitched from the heart project. He has my heart! My friend will get the next gift when she moves into her new home! I have several family birthdays and graduations coming up this spring so will be doing gifts for those-love the sweet projects in this book. Thanks! From my heart to my little granddaughter who was only 19 oz when she was born and is now in Kindergarten – a brave survivor full of heart! The pocket wall hanging would be perfect for my daughter and her family. I think it could become a chores chart for her 5 children. Such beautiful stitcheries! I would love to make something simple, yet beautiful for my sister & brother-in-law for their new home. What a lovely book! My next handmade gift will be for a friend. The next gift will be for my son in laws mother who is going into assited living next week. Maybe a nice pillow or small wall hanging. My daughter’s best friend. I have made her a baby quilt for her baby shower this Saturday. I will make the I Am Brave hanging for my granddaughter. She lives far away and it will remind her that I believe in her strengths! My daughter will be the recipient of my next project. She has requested summer sun dresses for her birthday this month. My sister died just a few months before her son is to graduate from college. I found some wonderful old buttons among her things. I want to make something for my nephew for graduation using those buttons. This book looks like the perfect inspiration. I love this book! So many projects that would make perfect gifts for family and friends, and me, too. My best friend and sewing buddy is moving to another state in the next couple of weeks. I want to make a very special quilt and present it to her when I visit this Fall. A family member would be my first choice. My youngest grandson will be getting a quilt with trucks on it for Christmas. Every year he gets a gift that has something to do with trucks. This year it will be construction trucks in a quilt. My sister who has ongoing health issues and never complains, just keeps doing things for others! I am always making quilt for someone, I have a baby shower and two weddings coming up but, I would love for Anita Treasure to win it..She is taking care of her daughter and grandchildren . I would love to make the flowers with pockets for my granddaughter – tucking little notes into each. Beautiful, I would make something for my sisters! My oldest granddaughter will be the next recipient of a handmade gift. A quilt will be made for her baptism. Three friends with April birthdays! I think I will make something for me and my sister. I would make something for my brothers. My next project is going to two of my grandchildren for Easter I also have a new granddaughter and will begin a baby quilt for her after the Easter projects are complete!! My daughter who needs a little uplifting at this time. It would be for my grandson in the army. What an adorable collection of quilted gifts! Would make my Christmas list complete. Simple but wonderful gifts for giving. It is time I made something for my sister. She doesn’t quilt but loves them. I would make something for my mom and best friend. The book is one I could look through many times and still see something new each time. My granddaughter, her parents are raising her to be brave (shes 2 1/2) and I love the birds and flowers! quilt. Have eyed this book since it came out so it would be great fun to win and create so many of the darling projects included. The pocket wall hanging for my sister would be perfect. I am picking me to receive a handmade gift from me. I love the simplicity of a few of the patterns in this book. It will be hard to pick one to start with but I am sure I can do it. Thank you so much for this giveaway. Love your work! So many sweet gift ideas, I would have to give some thought as to what to make next and for whom – but what a fun puzzle! I’l be making something foe a friend that moved across the country last summer. My granddaughter will receive a quilt in her school colors when she graduates from Murray State University on May 11th. Probably a niece’s wedding Quilt. Thanks! I would make something for my mom. She has made so many beautiful quilts for us. Thank you for the giveaways! There’s something soothing about stitching with your hands. You are up close and personal with the fabric, thread, and project. There’s a continual touch and inner action. As you stitch your mind wanders to special thoughts and memories. It slows down the wild world outside the door. A deer friend has just passed away which brought home the need to not only tell friends that you love and appreciate them but giving them a little something hand made provides them the opportunity to remember your connection and passed interactions. So many wonderful projects…and so many inspiring stories in the Comments. There seems to be no end to the ways that our gifts can help others. My project would go to my sister..she has done so much for others. It would be something small…we are both trying to downsize..something she could use everyday. My sweet mother-in-law would be my recipient. I always say that I have the very best one in the whole world! Always willing to help in any way. She has a full time job caring for my father-in-law who has Parkinson’s Disease. She just contracted Shingles, so painful. 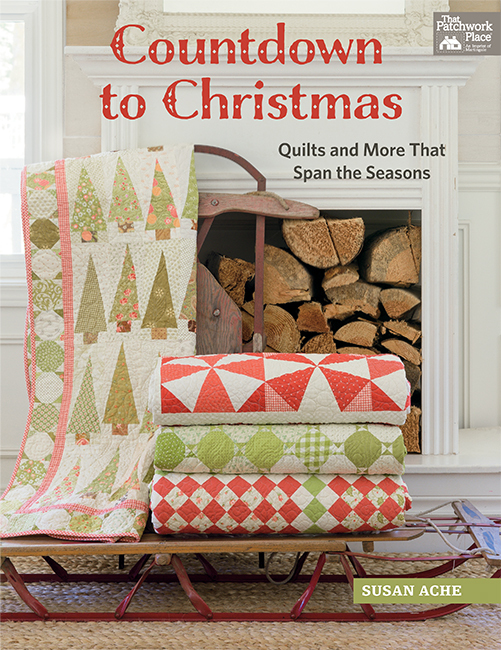 Being a prolific quilter (she got me started), she would love everything in this book! Probably a friend – these gifts are perfect for lifting spirits and showing someone that they matter. I would give to my cousin, Layne. I was close to her mother, who also like to quilt and sew. Layne and I became very close after her mom passed away from cancer. We’ve done our own quilting bee for other cousins wedding quilts we’ve made together. Probably my mom and/or mother-in-law for Mother’s Day!!! My daughter,she’ so precious to me. very much looking forward to making baby quilts for my nephews and their wives!!! I have a couple of friends who have had cancer and now cancer is back. The ideas in this book are sew pretty. One of my friends would recieve the project, just because. I would make something for my daughters or daughter-in-law–they would all enjoy something like these ideas. Some good friends who had a house fire. Something to hang on the wall for a new beginning. For my little granddaughter is is indeed a very brave child. My son’s birthday is this month and I am making him a teapot Cosy. She, don’t tell him. My mom! For Mother’s Day. i just finished a quilt for my grandson that features cars. i will put it in the mail tomorrow then start a quilt for my granddaughter. Linus project quilts I just finished 17 quilts in two months, time for self fun. I love so much about this new book. I would make one of the projects for my dear friend who has had so much to deal with this year so far and thus is facing surgery in May. Thank you! My nephew, who just turned 8. My best friend and sewing buddy, Susan! This looks like a beautiful book. My latest quilt finish is for dear friend, who is always there to listen!! My oldest granddaughter, Elyssa, who is 15. She loves anything homemade and makes “Grammy” a gift every Christmas. She’s an old fashioned girl in this day and age. Thank you. My daughter is getting the next handmade gift! She loves them! I will definitely make something for myself! What beautiful projects! I’d love to make these for both love ones and friends. I will be making a pillow (or 2) for my sister’s birthday. I will be giving a Texas Police quilt to a retired police officer. What a beautiful book – lots of great ideas. I am working on two memory quilts for my daughter in law right now. One of my daughters or maybe all of them for Mother’s Day. Today I’m sewing the labels on 2 baby quilts for my new twin great niece and nephew! I am teaching my son’s girlfriend how to sew. I think it would be fun to surprise her with a gift from this lovely book. I am making a quilt for my husband. It is all hst and they sure are hard to do. I think I am over my head with this quilt but I promised him I would make it and that is what I will do. My next project will be given to my 9 yr. old granddaughter I am teaching to sew/quilt, because she is so very special to me. Maybe a project we could do together…making memories. I would love to win this drawing. The first gift I would make is for my best friend Brenda and it would be the stitchery on the piano. Probably one of my daughters or one of my sisters. Thanks for the chance to win! I love making small gifts for my friends at quilt retreats. I have e one in the fall so I have time to make gifts for them. We have a new grandson so he’ll be the next one to get a loving gift from his Grandmom! I would make something to hang on my parents’ door at the assisted living facility they just moved into last week. Hopefully it would make it feel more like home. Well, got a couple of projects on the go at the moment – a fair size quilt "throw" for the settee, blocks using Drunkards Path (not sure what I’m going to do with these yet 🤔) and I’ve got another project in mind – a gorgeous peacock blue table runner with blush pink water lilies. Also, fabric photo frames make lovely gifts for friends – decisions, decisions! But I can’t wait to start on the table runner, so guess that means I shall be nominating myself to receive my next quilt! My sister. I haven’t made a quilt for her in several years. I think it’s time to make something new for her.